Ultraportable data projectors are becoming increasingly common, largely due to the use of DLP (Digital Light Processing) chips from Texas Instruments with the Viewsonic PJ256D being the latest addition. It shares a body design similar to the likes of HP and Toshiba machines and is compact. Set up is incredibly easy, but while the zoom switch is convenient, the focus ring is fiddly. The menu system is simple with a number of presets. With support for front or rear projection, you can discreetly use the unit anywhere. Being a business machine, you'll find it has a native 4:3 aspect ratio, but will scale to widescreen if you need it to, meaning you'll be able to watch DVDs as well as use it for work purposes. Picture quality was impressive, even in an office environment but not as clear as on the Optoma unit. With a single vent at the front of the unit, all the heat pours from the right side of the unit and we found the projector got extremely warm to the touch almost immediately. Connections on the rear of the unit comprise the basic connections, covering S-video, video and VGA connection. It's common for compact units to lack audio functions, so you'll need to rely on your laptop for sound. Weighing in at 1kg, this is the optimum weight for a machine for the regular traveller. The supplied carry case is large enough for the unit and cables. 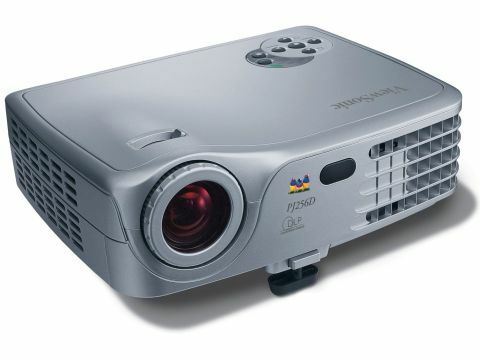 This is a neat and tidy projector that business travellers will find an asset, especially as you'll be able to use it in the evenings for relaxation.